OKEECHOBEE, Fla. — Alabama’s Shaye Baker picked a good day to catch the biggest bass and biggest five-bass limit of his life. The young pro’s catch totaled 29 pounds, 8 ounces, and his best largemouth weighed 9-1 to give him a 4 1/2-pound lead over fellow Alabaman and Bassmaster Elite Series pro Russ Lane at the Bassmaster Classic Wild Card presented by Star Tron. 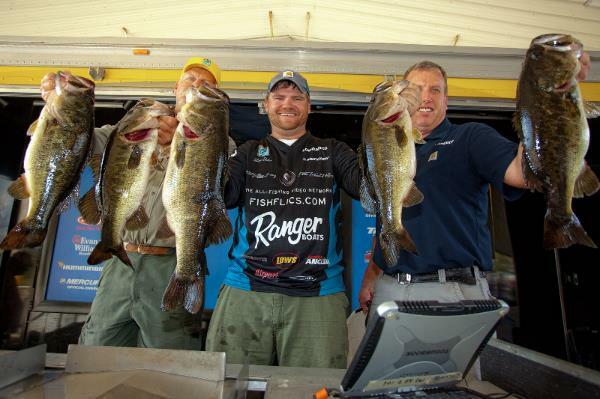 In an informal poll of competitors at tournament registration on Wednesday, Baker guessed that the eventual winner would weigh in more than 72 pounds of bass over three days. It was one of the heaviest predictions, and today it became obvious why he was so optimistic. “I knew I was around some good fish,” Baker said, “and I tried hard not to catch them during practice.” His 9-1 lunker stands as the Carhartt Big Bass of the tournament so far. Baker was predictably closemouthed about his methods and location today, but he did acknowledge that his catch came from pitching and flipping to aquatic vegetation in less than 5 feet of water. Though he wasn’t sight fishing, he couldn’t be sure that some of his fish weren’t in the spawning process. As for location, Baker said that he was “in or around the Monkey Box,” a legendary fishing area on the west side of giant Lake Okeechobee. While Baker wasn’t so bold as to say that he would repeat his big catch tomorrow, he did say that he felt he could get enough bites to do well. “I could have 30 pounds, or I could have zero,” he noted. Just one good bass back is Elite pro Lane of Alabama with 25-0. He was more forthcoming about his methods, saying he was “pitching and punching a Big Bite Baits Real Deal Craw” a soft plastic lure in the “hematoma” color. Lane targeted heavy, matted vegetation for his limit, which included a lunker that weighed 8-6. 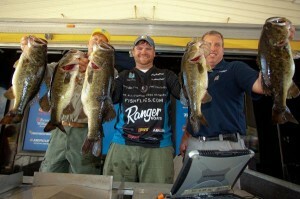 Chad Morgenthaler of Illinois ranks third with 24-4. Greg Hackney of Louisiana is fourth with 21-15. And Ohio’s Fletcher Shryock rounds out the Top 5 with 20-13. 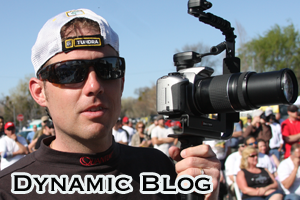 Four of the Top 5 and nine of the Top 13 spots are held by anglers from the Bassmaster Elite Series. Despite the fact that there are 13 Floridians in the field, none are in the Top 5, and only three are in the Top 10. Jesse Tacoronte of Orlando leads the pack in sixth. Half a dozen anglers topped 20 pounds on Day 1, and six are within 10 pounds of the leader. The full complement of 49 anglers will compete again on Friday, after which the field will be cut to the 12 with the heaviest two-day catches for the final round on Saturday. 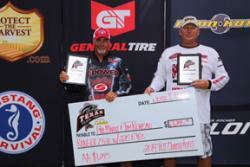 Cash prizes will be awarded to the Top 30 anglers, but only the winner will earn a berth in the 2014 Bassmaster Classic.